Elvis Today: Elvis ... If He's Out There We'll Find Him! 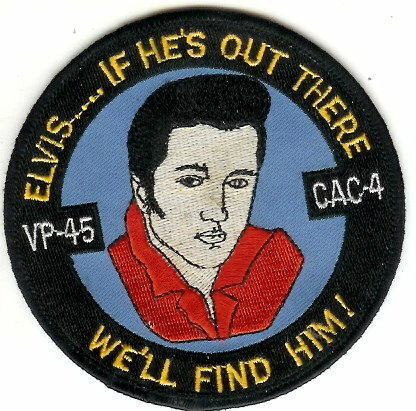 Unfortunately, there was no mentioning about the Elvis patch, so that's why I've decided to try to contact you, to see if you can help me out. (I've also contacted the VP-45 Association with the same question.) I actually got one google hit mentioning the patch as an unofficial patch, but the link didn't work so I couldn't read more about it. Thank you very much and merry christmas and a happy new year to you! Unfortunately I never received a reply, nor from the VP-45 Association. 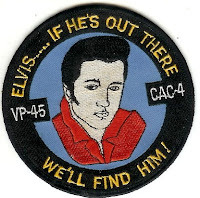 For some reason I came to think about this yesterday and dug out the patch from the drawer where it's still residing together with another military patch with an Elvis connection. I then sent the Patrol Squadron VP-45 another e-mail, with the old one attached, explaining that I never received a reply, and would be grateful if the present PAO could help me out this time around. Of course I realize that he has more important things on his mind than starting asking his squadron mates questions about an old aircrew patch with Elvis on it, but I just had to try one more time.